Home / Expert Advice / All You Need to Know About The Causes And Treatments of Dark Spots Welcome visitor! Have you noticed dark spots on your face, hands or décolleté? Hyperpigmentation is a top concern on par with aging and wrinkles and affects clients from every ethnic group. While you may feel that these spots appeared out of nowhere, the truth is that they have probably been brewing for decades. The pigment melanin gives our skin its color. It is produced to shield the skin and protect it from the sun. When skin is exposed to the sun, melanin production increases and causes a tanning effect. This tanning process is the skin's natural defense mechanism against sunburns. Hyperpigmentation can be caused by several things, such as genetic makeup, hormones, inflammation, post-inflammatory processes in the skin, and sun (UV) exposure. The biggest culprit, which is also the most avoidable, is the sun. 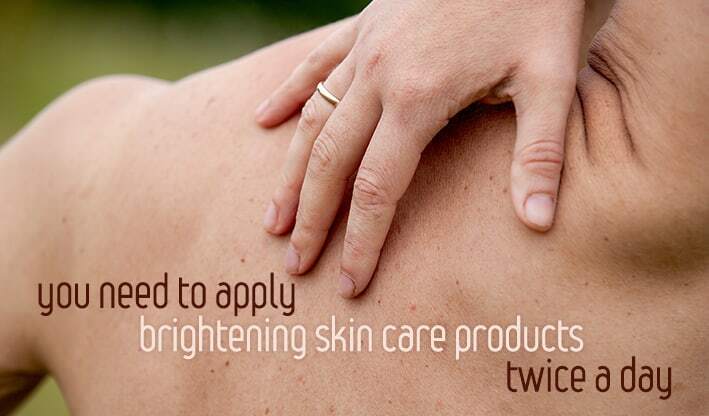 The skin is continuously bombarded with ultraviolet radiation from the sun. Ultraviolet rays are made up of long wave UVA and short wave UVB. UVA rays tend to penetrate deep into the dermis layer, resulting in damage to the skin and is the main reason skin wrinkles prematurely. This is called photoaging. UVB rays cause the skin to tan. Extended exposure to UVB rays – especially between 10 am and 4 pm - also causes sunburns. On the other hand, our body needs the sun for the absorption of vitamin D because without vitamin D, calcium would not be absorbed, leading to osteoporosis. Unfortunately, hyperpigmentation is not caused only by the sun. Although sun exposure is the largest contributor to age spots later in life, antibiotics and contraceptives can induce inflammation in the skin that can lead to hyperpigmentation. For those suffering from acne, the long-term use of strong oral prescription medication can sometimes increase the skin's sensitivity to sunlight and cause inflammation. If prescription retinoids are overused and sunscreens are not applied regularly, sensitivity and inflammation can be triggered. Post-inflammatory hyperpigmentation causes the skin around a wound, typically an acneic pimple, to darken and discolor. Although post-inflammatory hyperpigmentation can occur in all skin types, it is seen most often in ethnic skin. It also affects men and women equally. Melasma is caused by a hormonal imbalance between estrogen and progesterone. This type of hyperpigmentation is frequently seen in pregnant women. While other dark spots can be permanently lightened, unfortunately this form of hyperpigmentation cannot. It can be controlled by a strict daily skin lightening regimen but any UV exposure, or even heat exposure can trigger melisma, and the dark spots are back again to start the process all over. The best treatments you can seek are performed by skin care professionals at spas, such as microdermabrasion, chemical peels or laser treatments; however as hyperpigmentation did not occur overnight, a few treatments will not erase all those spots either. Even if you seek professional help, you must do your homework, and you need to apply brightening skin care products twice a day for weeks or even months to achieve an optimal result. If your skin is resilient and you have large spots or stubborn hyperpigmentation, you may alternate these products weekly. Next post: Say Goodbye to Winter Skin!